Belts under this category exhibit uniqueness, as they are made of crochet thread and are wonderful to look at. These belts articulate perfect blend of style and class. Available with us in cost effective manner, these belts are sure to become one of your most priced possession. 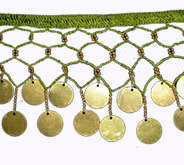 Desc : Charmingly adorned with stunning green crochet designs and suspended metal pieces, these crochet belts will definitely tempt the ladies to wear at once. 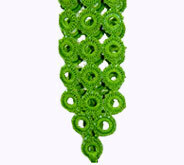 Desc : Green colored crochet fashion belts are the outcome of the skill and imagination exerted by our expert workers. 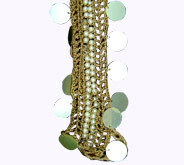 Desc : Proficiently crocheted & adorned with pearls & metal pieces, crochet fashion belt is the perfect specimen of artistic craftsmanship.